Posted May 8, 2016 by HPGhotrodLogin & filed under Uncategorized. If you’re like me your probably saying to yourself, “I don’t remember that TV program”! It was hosted by a man named Irwin “Sonny” Fox on Sunday mornings and was a CBS kids news magazine where the host and two kids would experience locations around NYC and the US. It aired from 1955 to 1958. I’ve never seen a re-run and it isn’t even listed on the Internet Movie Data-Base (IMDb). So it really has been lost. I found only one episode on YouTube. It was very popular at the time and Sonny went on to do the Wonderama TV show and later produce news magazine shows. He had quite a career in television! Apparently, back then Revell thought that this particular show was a good way to market more of their model kits. 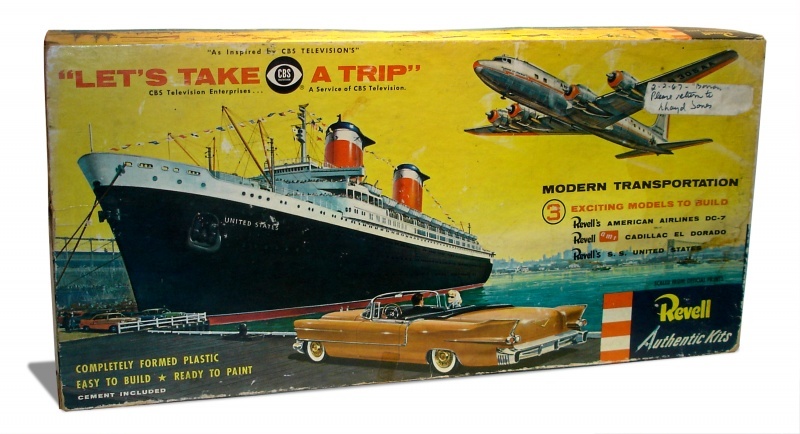 So in 1956 they issued the “Let’s Take A Trip” kit. This large kit box contained three different modes of transportation, a ship, a plane and an automobile, not to mention the CBS logo and a total of four references to CBS. Inside the box were the three kits in separate bags and cardboard covers with windows. The kit I have doesn’t have a window cover over the ship. I did some digging and the histories of the vehicles represented are rather interesting. The ship is a model of the S.S. United States passenger liner. It was built in 1952 and designer William Francis Gibbs intended this ship to be a state of the art passenger cruiser with the capability to be converted into a troop carrier in the event of war. It was fireproof and no wood was used in the construction except for the two grand pianos made of fireproof Mahogany. More aluminum was used in the S.S. United States than on any other previous construction project in history. The idea was to have a fast lightweight ship. They were successful! On its maiden voyage it broke all trans-Atlantic speed records in both directions. It still holds the record 60 years later. Impressive considering that it is 100 feet longer than the Titanic! Placed on end it would be nearly as tall as the Chrysler Building. Even so, it was just 101 feet wide so it could pass through the Panama Canal with two feet clearance on either side. It was retired from active service in 1969. There is now a conservancy that is trying to have the ship restored. It is still solid and structurally sound. 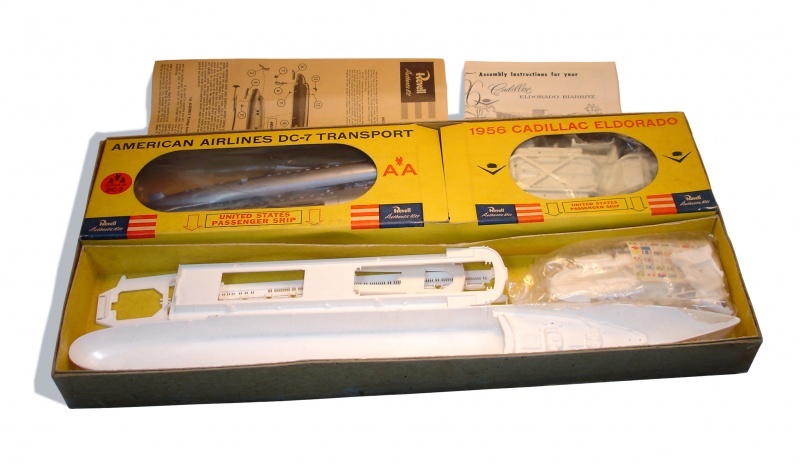 The model plane is the Douglas DC-7. It was introduced in November 1953 and it was the last major piston-powered transport made by Douglas. (The DC-8 was jet-powered.) The kit features American Airlines decals. They were one of four major users of the craft, there were 21 in all. Only 343 were built between 1953 and 1958. 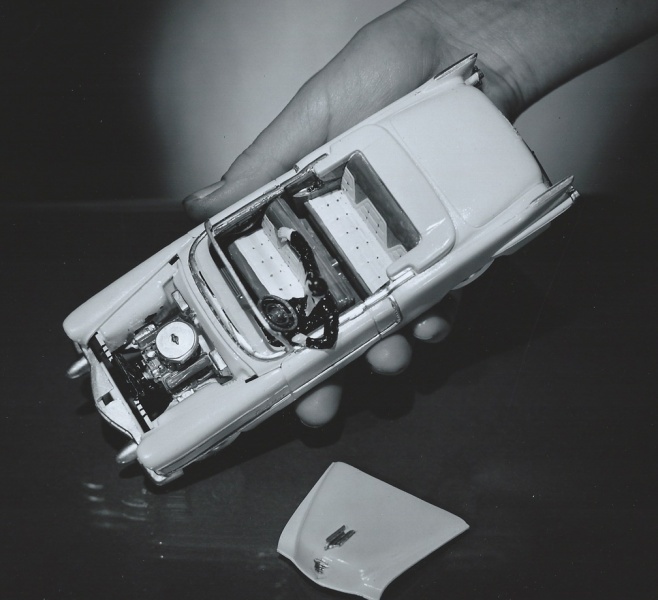 The car in this set was the 1956 Cadillac Eldorado Biarritz convertible. This was Cadillac’s exclusive personal luxury car offering. The Eldorado was first introduced in ’53 as a limited production vehicle. Apparently there was a contest to name the car when a golden anniversary concept vehicle was introduced in ’52. 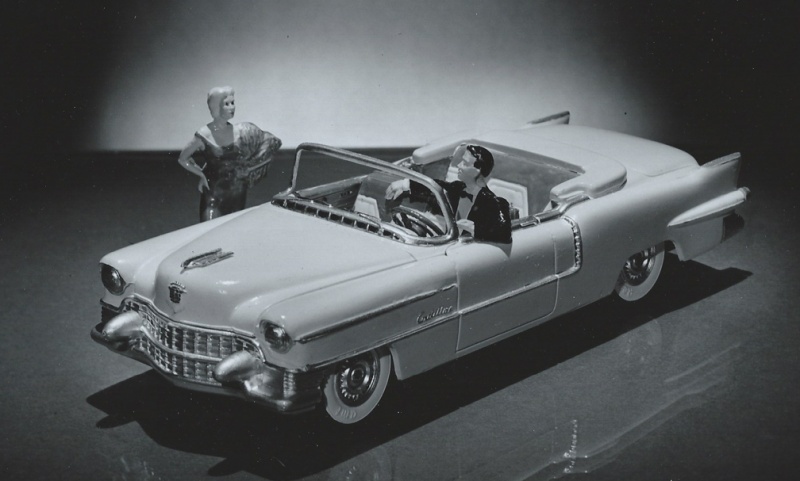 A secretary in Cadillac’s merchandising department named Mary-Ann Marini came up with the winning name; Eldorado! The exclusive cars were primarily convertibles but in ’56 Cadillac offered a hardtop version. That created a need to distinguish between the two cars and the new hardtop was named the Seville with the convertible being the Biarritz. There were still just 2150 convertibles made even though it was a peak year in Eldorado sales. The kit is 1/32 scale with a multi-piece body and was made as a joint venture between AMT and Revell. I have researched a few sources about the two companies relationship but haven’t found the answer yet. 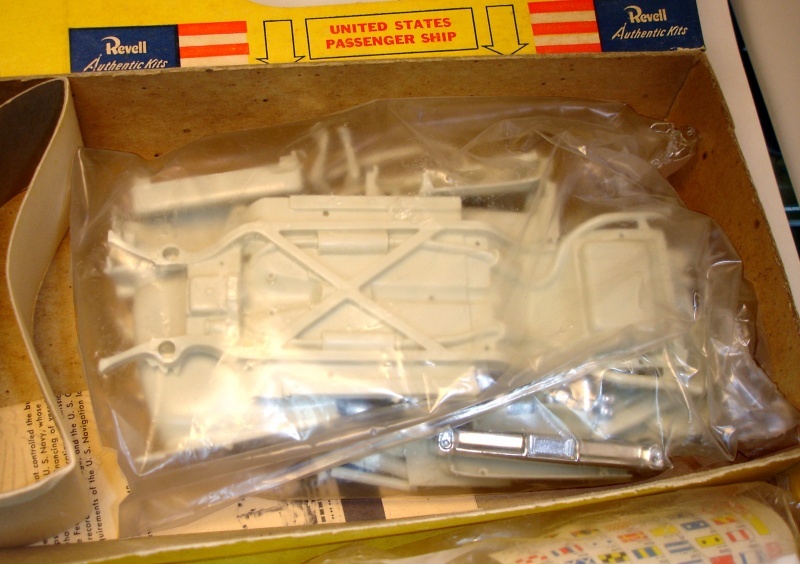 The fact was, that by 1955 AMT was very good at making exact scale tooling and Revell may not have been. Although in subsequent years they offered nicely engineered multi-piece bodied cars probably with lessons learned from the AMT venture. It is still a bit of a mystery to me. Below are two photos from the Revell archives. They are of the built ’55 Eldorado kit. 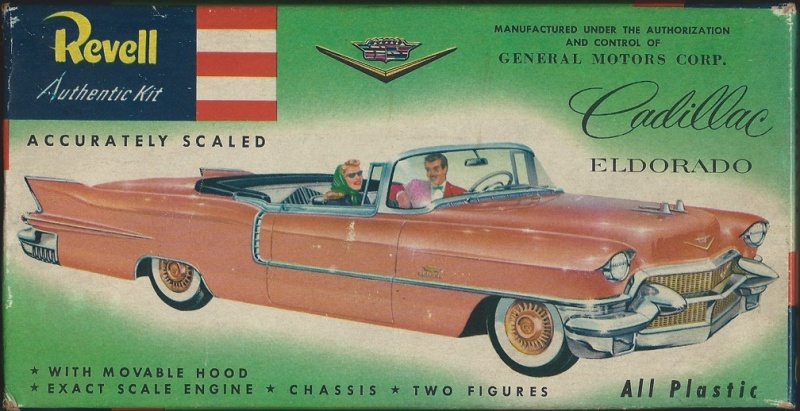 I don’t have any photos of the ’56 at this time…I haven’t built mine yet! You can get an idea of the scale and detail of the kit from these photos. Originally this copy of the Take a Trip kit belonged to someone who must have worked at Revell. They loaned this rare kit back to the design department in 1967. What Revell wanted it for is anyone’s guess. It was supposed to be returned but never was. This is a very rare kit and, in my opinion, it belongs right along side the scarce Autorama kits. (Those sets contained four of their 1/32 scale cars.) “Let’s Take A Trip” is another treasure rescued from the old Revell archives that were closed out when they moved to Illinois to join with Monogram. That will wrap up this action-packed episode of the Hot Rod Bunny blog! I am sitting in Ikea’s cafe in Philadelphia looking at the ss United States. I remember a trip to tour the ship in New York when I was a kid. It was hosted by sonny fox! Does anyone else remember this? Amazing that I post and article about that ship and you find it while sitting looking at that ship! The “Let’s Take A Trip” show was on when I was very young plus I lived on the other coast. I don’t know if it was carried on the west coast CBS channel. Glad you found the HRB web site!